Tobias S. Buckell began his novelistic career with a very nice linked trio of books that fit fairly readily with what has been called “New Space Opera” – adventure stories set in space (or at least on distant planets), the main difference between “New” and “Old” Space Opera being a greater concern in the newer stuff for non-white characters, and perhaps a lesser belief in the primacy of humanity’s position in the Universe. His career hiccuped a bit in recent years, partly simply because he was changing course to a different sort of book, but more seriously because of some health issues. But his new novel, Arctic Rising, is now out, and it’s another cracker – as full of action and neat Sfnal ideas as his first three books, but set on Earth in the near future, and taking as its subject a central contemporary concern, global warming. Well, I’m telling too much, I suppose. At the plot level Arctic Rising is pure thriller, complete with short sharp chapters, plenty of action, plenty of twists. And in that sense it is wholly satisfactory – it’s fun, the characters are involving, the action is perhaps a notch beyond plausible but probably more believable than the run of thrillers. (Though there are moments – suffice it to say, I can plausibly claim, in my day job, to almost be a “rocket scientist”, and Buckell portrays a missile launch here that certainly stretched my suspension of disbelief!) 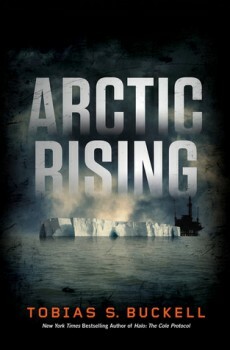 More importantly, however, at the idea level Arctic Rising is Science Fiction. And here it is even more satisfying. It’s a Global Warming story, no question about it, but with a refreshing lack of didacticism (which is not to say Buckell denies Global Warming in any sense). Part of the conflict here is between those who believe adapting to “the new normal” is the sanest course and those who wish to reverse the warming trend, and Buckell gives both sides their say and doesn’t insist on a right answer. Another aspect of the book is a look at possible ways to reverse Global Warming, such as Gaia Corporation’s new technology – these ideas are kind of neat on their own, and the book doesn’t shy from examining the real consequences of such ideas. Arctic Rising also examines near future social adaptations, from a glancing look at effects on international politics as well as specifically on the US, Africa, the Caribbean, etc. ; to a more detailed look at some social experiments in the newly warm Arctic, especially in the new “Arctic Singapore” of Thule. All in all this is a first-rate SF thriller. Buckell is a writer with a track record of producing traditionally-shaped SF (that is to say, Space Opera) with non-traditional ethnic characters – here he has moved to another traditional SF subject (the near future Earth) with equal effectiveness. Rich Horton is an Associate Technical Fellow in Software for a major aerospace company in St. Louis, MO. He writes a regular column and book reviews for Black Gate, as well as a monthly column on short fiction for Locus and reviews for many other publications. He also edits an annual anthology, The Year’s Best Science Fiction and Fantasy, for Prime Books. He maintains a website at www.sff.net/people/richard.horton, and can also be found on Live Journal. Non-white characters… hates mankind… female protagonists… global warming… oy vey, did the guy put every tiresome politically correct trope in a blender and hit frappe? Let me guess, if the heroes are radical Green Gaians, the bad guys are gonna be white male capitalists of some sort. Yawwwwwnn, over the right shoulder with this dreck. Yes, how dare anyone include non-white characters or female protagonists? I mean, everyone knows that white men are the only people worth writing about or reading about *rolls eyes*. He can dare whatever he likes — but it won’t be anywhere near as risky, daring, and interesting as he (and apparently you) think it is. Leftist politics dressed up as science fiction = BOOOOOOOOOOOOOOOORRRRRRRRRRINNNNNNNNNNG. When I saw that the book was so overtly, self-consciously, nauseatingly political, my eyes started rolling so hard they practically flew out of my face. You’re very good at reading things other people aren’t saying. Perhap Lugo if you commented on books you had read. people might value your opinion more highly, , Maybe some Heinlein or some Weber, oh sorry they have women heros and non whites I forgot you don’t read that left wing stuff. Really? You mean I’m not allowed to comment based on this review here? Does that mean Bill Ward’s characterization of the book is inaccurate in some way? Ward did not call out the most significant themes and messages? Since you have read the book Arctic Rising, you will be able to enlighten me on this score. You have read Arctic Rising, haven’t you? (Sigh) Heinlein generally didn’t let his personal politics and the identity of the characters get in the way of the story. And again, since you’ve read Arctic Rising, you can tell me that the author isn’t using the characters and the story in a heavy-handed effort to beat the reader over the head with his personal politics, as one could reasonably conclude from this review. Lugo, Rich Horton reviewed this book, not me, just like it says in the title and again at the top of the review. That’s his bio at the end of the review, too. One could only “reasonably conclude” that from the review if one approached it with a particular agenda. Actually, from my reading of the review, it looked as if maybe the radical green organisation were as likely to be the villains as anyone. The Heinlein comments are interesting. I think there are many people who feel that at times his politics got a little bit in the way of the story – have you read “The Day After Tomorrow”, perchance? Of course, whether one feels that the politics get in the way of the story is going to depend, to some extent, on whether one agrees or not with the politics being espoused. OK, sorry — but nevertheless we have no reason to doubt that Horton’s review accurately represents what’s in the book, do we? Yeah, I guess you only *notice* someone else’s transparent, heavy-handed political agenda if you have a particular agenda of your own (rolls eyes). Gee, you mean you are forming opinions of the book based on the review, without having read the book itself? Shock, horror! The review says “the radical Green organization Gaia [has] a plan to stop global warming.” To conclude from this that Gaia are the bad guys, you must believe that it’s bad to stop global warming. Whatever you may think about global warming, I certainly did not get the impression from the review that Buckell thinks global warming is not a problem and doesn’t need to be stopped. Many people read (or see) Starship Troopers and assume Heinlein was some sort of fascist. This was far from the case. He wasn’t even conservative. He was, in fact, a Leftist (which is not to say he was pro-Soviet or pro-ChiCom). That knowledge puts the idea that his supposedly fascist political views got in the way of his stories in a different light. Not really. Heavy-handed political diatribes of any sort ruin a story. A good many of Tom Clancy’s books, for example, are right-wing political lectures masquerading as novels. Having no interest in Clancy’s puerile political opinions, I find his books unreadable.